A single day in Venice could easily be eaten up by strolling along canals, snapping photographs, and climbing over countless bridges. But, for those looking to maximize time in the floating city, here’s how to pack in classic sights, a dose of culture, and some romance, too—all in one day. It’s possible to hit the classic landmarks of Venice, Piazza San Marco, Doge’s Palace, and St. Mark’s Basilica, in just one morning. Make the most of your time with skip-the-line tickets with premium access, as some of these tours also include secret itineraries, opening doors that aren’t normally accessible to the public. Alternatively, cover ground quickly with a hop-on hop off boat tour that allows you to get out on the water and see all the major attractions on your own schedule. Get to know the character of Venice by focusing on its culture. 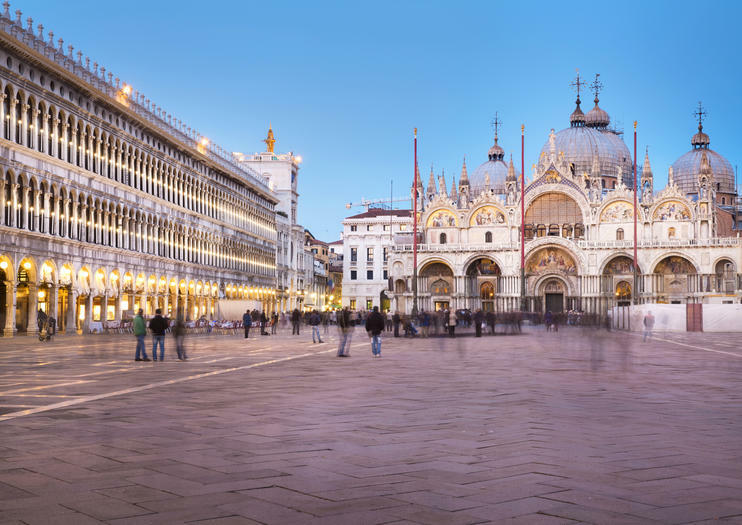 This could mean a guided food tour through the Rialto Market with stops for traditional Venetian snacks (cicchetti) or a private tour of the Peggy Guggenheim Collection, home to works from artists including Jackson Pollock. Local culture is also found in off-the-beaten-path neighborhoods such as Dorsoduro, away from the major landmarks. Explore these spots on a walking tour or a Venice Canal cruise that sails down quiet, secret canals. It is tempting to find a restaurant along a small canal and remain there for a full evening, but there are many after-dark activities to try in Venice. Those interested in history may want to set out on a walking tour focused on Venetian ghosts and legends, while music fans might wish to get tickets for a local classical music concert. For romance, climb aboard an evening gondola for a ride along the lagoon, complete with serenade from your gondolier. Hear Antonio Vivaldi’s magnificent ‘Four Seasons’ performed by Venice’s acclaimed I Musici Veneziani. The 1.5-hour show will whisk you back to 18th-century Venice, with performers dressed in traditional Venetian costumes and a spectacular setting in the exclusive Salone Capitolare at the Scuola Grande di San Teodoro. Take advantage of the opportunity to see the incomparable Peggy Guggenheim Collection in Venice with a private guided tour. Visit the palazzo that was once Ms Guggenheim's home, overlooking the Grand Canal and filled with pieces from her personal art collection. Learn about this important gallery's place in the history of 20th-century art. Dive into the delicious tradition of cicchetti and wine in Venice with this 2.5-hour food tour. Get insider tips on where the locals go to eat and find out what Venetian dishes to try. Explore the maritime history of Venice with a knowledgeable guide as you walk through the colorful Rialto Market. See a local butcher, baker and spice shop. Get to know some of the canal city's secrets during this 1.5-hour walking tour of hidden Venice. Let an experienced local guide show you some of the city's more off-beat sights. Walk from the popular St. Mark's Square to the Rialto Bridge to find the hidden gems along the way. Enjoy seeing this unique city at a leisurely pace.